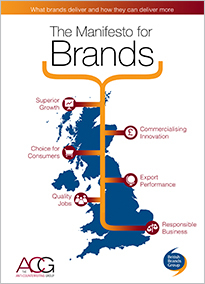 To build in Britain the optimum climate for brands to deliver choice and value to consumers, through constant innovation and fair competition. The British Brands Group, founded in 1994, is a non-profit-making membership organisation. Its role is to speak out authoritatively on behalf of brands and to represent them collectively when relevant commercial and regulatory issues arise. While the Group’s work focuses on UK policy, it also seeks to deepen understanding of how brands benefit consumers, society and the economy by delivering choice, value for money and innovation to consumers. The British Brands Group is part of a global network of similar brand associations, and is the UK representative of AIM, the European Brands Association, based in Brussels. The current Manifesto for brands was launched in December 2014 and outlines the contribution that brands already make to the UK. Brands empower consumers, spur innovation and underpin competitive markets. This is crucial to the UK’s economy, the generation of wealth and jobs and global competitiveness. To some, a brand may just be a name, logo, corporate identity or simply recognisable packaging. To others it may be a “trust mark” – a guarantee of consistent quality. But to a brand manufacturer it is its most valuable business asset. In fact a brand is all these things – and so much more besides. It is the sum of an individual’s knowledge of and feelings for a specific product, service or company and is built by companies delivering consistently on a relevant promise of quality and value. For the consumer, it makes choosing much easier and allows them to buy with reassurance and confidence. A company focused on building a strong brand takes note of what the consumer wants and places great emphasis on research and development to meet their needs and remain relevant. Such innovation is the stimulus of a living, dynamic market in which companies constantly strive for improvement. The result is stronger and more diverse competition, based on quality as well as price. Branding creates jobs and wealth – 1 million people are employed in the UK in creating and building brands and companies invest some £33 billion a year in such activity, representing a £16 billion investment in the UK economy (12% of all intangible investment). * Brands provide work in poorer economies and their well-known name brings a transparency to working conditions in those countries, yielding higher standards. Brands are so much more than just a name. The British Brands Group recognises the value of brands and their wide-ranging contribution and is dedicated to supporting the case for brands. For further information, go to Brands. The Group supports: a world-class climate in which companies may create and build brands in order to provide choice, quality and value to shoppers. Such a climate encourages innovation, responsible trading and vibrant, fair competition. The Group supports: a vigorous and fair competitive climate; competition based on quality as well as price; competition that empowers consumers; a competitive environment that helps consumers make informed purchasing decisions. The Group supports: building greater awareness of IP and its contribution to individuals, society and the economy; the existence and effective enforcement of IP rights to safeguard investment while maintaining vigorous competition. The Group supports: the free movement of goods between markets that are in principle harmonised; the right of trade mark owners to withold consent for their goods to be imported into the EEA where this may damage the brand’s reputation, increase potential for the circulation of counterfeits, undermine legitimate selective distribution agreements, or damage the competiveness of UK manufacturing. The Group supports: greater awareness of the importance of innovation; the existence and enforcement of intellectual property rights to safeguard investment while maintaining vigorous competition; initiatives which enhance the innovation culture within organisations; and the sharing of best practice. The Group supports: clear, distinct packaging that differentiates one product from another, does not mislead or deceive consumers and does not trade on another’s reputation; an effective means of resolving packaging disputes to minimise consumer confusion while safeguarding choice and competition; effective legislation and enforcement in the UK to prevent competitors trading on the reputation of another. The Group supports: shoppers receiving the products they ordered online, not cheaper, sub-standard substitute products. Where a product listing is featured on an online sales platform, only sellers offering that specific product should be featured. When the product leaves a distribution centre for the consumer, checks should verify it is the product ordered. When problems arise, fast, efficient and effective processes should be in place to rectify them. The Group recognises that markets differ and that these differences often affect consumer prices. Comparing consumer prices between countries in a way that allows robust conclusions to be drawn requires considerable care, ensuring for example that products are identical, the outlets in which the products are bought are identical, any effect of promotions, tax and exchange rates are discounted, and consumption patterns are comparable.